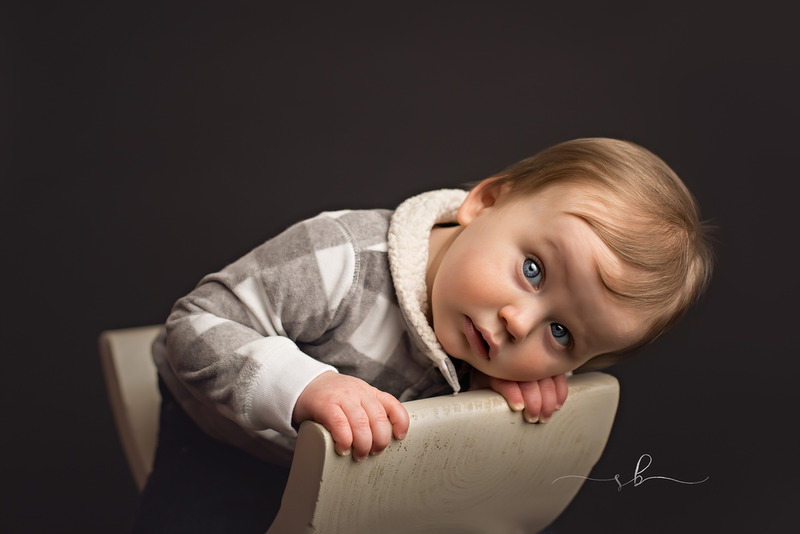 I have been photographing Jack every 3 months since his newborn session. He is now 9 months old! Watching babies and families grow.. this is absolutely my favorite thing about owning a photography business. It is so wild to me how a newborn baby comes into the studio, weighing only a few pounds.. solely and completely dependent on their parents. Then, in a few short months, they gained control of their growing bodies and are crawling, walking, grabbing, talking. They no longer need to depend on mom and dad for EVERYTHING.... they do depend on them for a lot... but they can now get from point A to point B on their own. They can hold their bottle on their own... feed themselves, remove their sock (LOL.. why do they always have to lose one of them too ;), climb on furniture.. heck... most babies these days have mastered a cell phone before 1!! Its so fun to look back at your brand new baby... trying to remember that new baby smell, the sound of their first cries... and just how darn small they were! 6 months!! My favorite pose for 6 month old is the toe grab <3 It won't be much longer before he trades in toe chewing for running & jumping.. Thanks for stopping by The Silver Blossom's blog! If you are ready to book the First Year Package for your newborn baby, click here.